Pilgrim’s Pride Corporation of Mt. 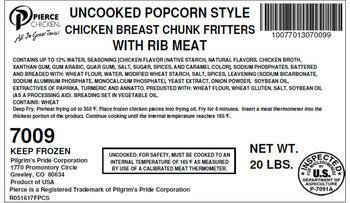 Pleasant, Texas, is recalling approximately 58,020 pounds of not-ready-to-eat breaded popcorn chicken. The recalled product, bearing establishment number “P-7091A” inside the USDA mark of inspection, was shipped to Publix Super Markets in Florida for deli food service use. Customers who have purchased the recalled product should not consume it, but discard it return it to the place of purchase. Consumers with questions about the recall may contact James Brown at (800) 321-1470.